Companies use Boardview for a variety of reasons, for their own company or their clients’. 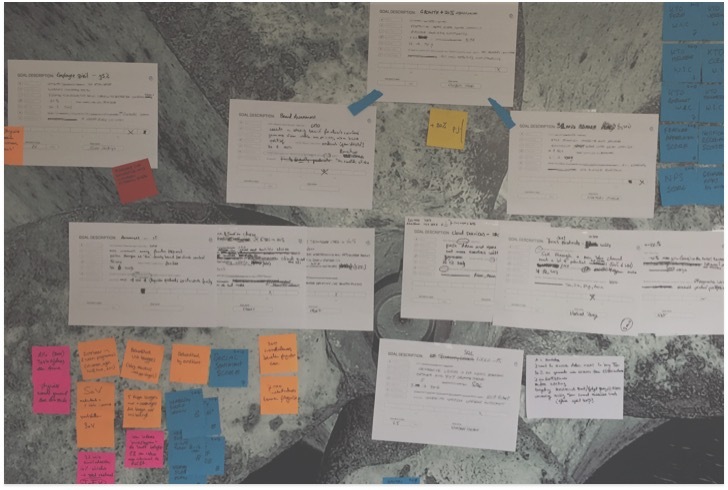 Here are three intriguing examples of how a strategy consultant, an agile trainer and a co-creation agent use Boardview to serve their customers better. Want to know more about these best practices? Contact us! Have you achieved success using Boardview? Let us know! If you have trouble logging in, send me an email. 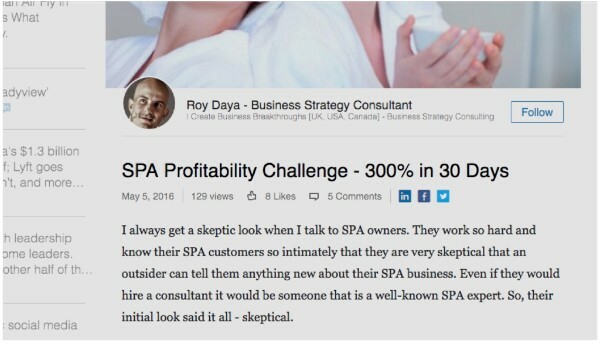 Roy Daya, a Business strategy consultant, was handed a particularly tough challenge: make a SPA 300% more profitable in 30 days. Daya is no SPA expert, so the SPA owners were a bit skeptical, to say the least. Thus, the SPA owners offered him a challenge where only merit would count. The deal was that just performing agreed upon tasks and coming up with some general insights would not cut it. Only cold, hard results would matter. No cure, no pay. Quadruple profitability before the end of the month or go home empty handed. Achieving such an ambitious goal in so little time requires an aggressive, comprehensive approach. Before you’re done iterating, failing forward, and learning by doing (and what not) the month is over. So, you have to go all-in right from the start. In the end, Daya improved effectiveness as well as efficiency, overhauled the customer base, changed the product offering, ran promotions, and everything else you can think of. But, crucially, he did so in a controlled manner. He knew what he was doing, why and for whom, at any given time. Realizing incredible results requires incredible planning, alignment and prioritization. When effectiveness is crucial and waste is lethal only the best stand up to the challenge. It is the story of a man and his horse, a strategy consultant and his tool in perfect harmony. Credit where credit is due. Well done sir. 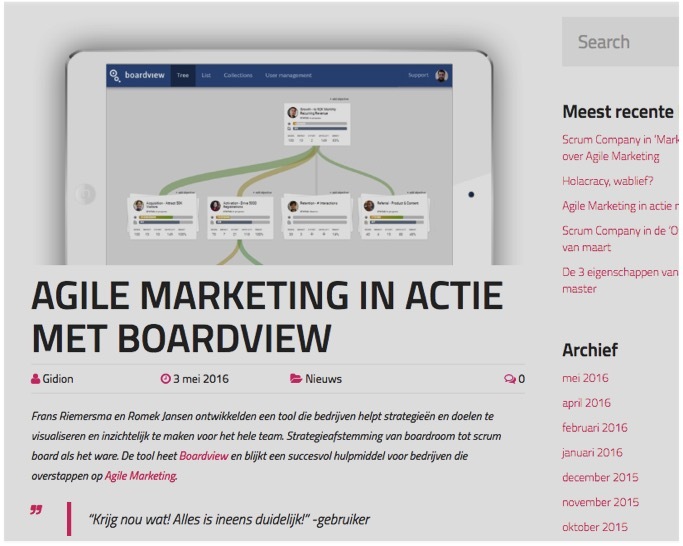 Roel Seegers is an agile marketing consultant at the Aan Zee agency. They help clients reposition, rebrand or otherwise fundamentally change their organization. And they have a particularly original approach to realizing it: co-creation. The agency gets together with a variety of their clients’ employees to deliberate and discuss strategy, and eventually achieve consensus on how to best renew the organization. Initially, everybody is invited to spout ideas on which strategic goals to pursue. Then, whichever goals have come up are categorized and structured harmoniously to form a goal tree, written down on the wall using post-it notes. In doing so, the significance of every goal becomes apparent to everyone involved. Everybody knows why he’s doing what he’s doing right from the start, which creates the commitment needed to make any project a success. When the all-day session nears its end, the result of the offline exercise is taken online and put into Boardview. The Aan Zee agency does not execute the decided upon strategy for their clients but gives clients all guidelines they need to do so themselves in a structured manner. We are happy the Aan Zee agency has been able to seamlessly enrich their hands-on, pen and paper strategy visualization exercise working with our online tool. Gidion Peters, co-founder of a leading agile scrum company in the Netherlands has successfully completed dozens of change management projects. He knows all there is to know about what makes change management involving multiple teams so perilous, and how to avoid losing the plot altogether. On a daily basis, managers get flooded by a waterfall of projects, Peters says. His clients often cannot cope with the rapid and constant change of affairs. The first thing to go out of the window is following the strategy, falling back to purely reactive and ad hoc production of deliverables. Peters has a special place in our hearts. He has provided us with invaluable insights about what it is that organizations usually struggle with as they adopt agile methodologies and try to make fundamental change happen. His experiences have been taken into account in the development of our product. He is about to start using Boardview to transform his clients’ organizations. It will make the controlled and well-coordinated implementation of agile scrum methods across the many teams of larger organizations much easier. The Boardview Team is happy to deliver just what the doctor ordered, and we cannot wait to see how future users (and their clients) will benefit from using Boardview.